Veteran Torrey joins the stable of author-illustrators contributing to the I Like to Read picture-book series, crafting a family tale of persistence and confidence that serves as a timely lesson in a text explicitly aimed at the youngest budding readers. This series dares to make entertaining reads from short texts and familiar vocabulary. Repetitions of “Moe can...” are offset by contrasting images of a “little” monkey brother attempting to accomplish tasks better suited to his older siblings. Torrey takes adult caregivers on a reminiscent journey through the familiar chores and lores of home life as a kid even as he transports child readers from the bathroom sink to the outdoor basketball court. 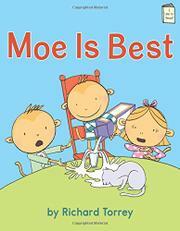 The older, playful siblings chide Moe’s overconfidence (“I am the best,” he says over and over) yet comfort him after countless missed baskets, helping him to realize he is the best at something: “trying.” The artwork lends as much simplicity as the language, stepping away from elaborate detail for a simple, streamlined palette digitally filled from the author’s illustration board. What readers are left with is a short anecdote of familial competition that delivers a quick but salient message.